The project Keimelion has enabled the University Library to offer unrestricted electronic access to outstanding items from its treasury of rare books on the basis of its Open Access policy, governed by the principles of the "Budapester Open Access Initiative" and the "Berlin Declaration on Open Access to Knowledge in the Sciences and Humanities". The University Library has used the call number "Cim." "(= "Cimelia") to bring together particularly costly works from its holdings since the middle of the 19th century. Today this collection includes more than 60 manuscripts, 11 block books, 13 incunabula and 54 valuable early printed works. A number of these rare books are considered to be objects of great international cultural significance. As long ago as the 18th century, when the University was still in Ingolstadt, the Library already housed some items separately. This can be deduced from a note in Cim. 69, according to which this particular work was brought to Munich because of its worth and in order to protect it from the dangers of the expected siege of Ingolstadt during the wars of the French Revolution. Entries in the main catalogue such as "In the Librarian's desk" or "In the iron cabinet" imply a policy of separation, a practice not only favoured by the value of the objects themselves but also fostered by the general spirit of "poison cabinet" censorship. According to the description of Head Librarian Karl Schafhäutl (1803-1890) some of the most precious books could not be traced when he took up his post in 1854. Others were in a desolate state; for example the letters of Leibniz were found crumpled up in an old chest. Schafhäutl had the rare books collected, catalogued, numbered in the chronological order of their origin and housed in desks with glass lids. The knowledge pertaining to the chronological order of the rare book numbers was nevertheless lost over the years, so that new objects were simply added to the end of the row as was seen fit, or placed next to any other works displaying similar properties. Unfortunately, some rare books have been lost. The letters from Leibniz to Ferdinand Orban (Cim. 21) were destroyed by fire during the bomb attack on Munich on July 16th 1944 after being fetched from their place of safe deposit to be consulted by a member of the university staff. Gregory of Tours' De virtutibus et miraculis Sancti Martini (Cim. 28), The Imperial chronolgy (Cim. 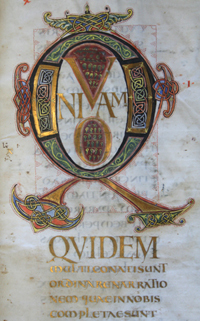 32), Bartholomeo Platina's Historia de vitis pontificum (Cim. 35) and Vitus Anton Winter's Über die ältesten Gesetze Bajuwariens (Cim. 41) had already been registered as untraceable during a stock check as long ago as 1908. Die Morgengebete für den hl. Versöhnungstag (Cim. 33) have been designated missing since September 1939.